Every one who attended the class this Sunday Jan. 27, was filled with awe when Shri Mahayogi graciously spoke at the end of the class. The words of Shri Mahayogi resounded strongly throughout the room and within the hearts of the attendees. Shri Mahayogi’s powerful message called upon all attendees gathered to see the illusion of the world in front of them and wake up to the Truth! Before we share Shri Mahayogi’s words, we would like to share with you how the events before this moment unfolded. Last Wednesday class, a young man came to meet his friend at the end of the class. As he waited, he saw the photo of Shri Mahayogi on the table nearby. He was strongly drawn to the photo of Shri Mahayogi, and kept saying “He looks so cool!” He heard from another attendee who is new to the class, the experience of being in Shri Mahayogi’s first class of the visit this past Sunday. That attendee expressed that the class was magical, and he was so grateful that it seems a habit he had been struggling with for some time, was all of the sudden and surprisingly gone after the class. This young man, never having practiced Yoga, came back to the class, without knowing what to expect, but simply drawn to Shri Mahayogi. Shri Mahayogi accepted one question from him at the end of the class. Mr. R: I’m aware that you can create your own reality by your thoughts. How does one master that process in order to manifest the reality that they see in their mind? MASTER: It is just like a dream. You all have all different kinds of dreams while you sleep at night. Just like that, the world that you see right now is developing like a dream too, from the creation of your mind. And almost all phenomena, all the occurrences in the world, are manifestations or creations of many people’s common thoughts, or images, so to speak. Simply, that is it. (laughs) Therefore, they keep changing, and they are not true Existence. It is the same for the mind as well. The mind is always thinking about something, and it creates something all the time. However, the mind is simply the function, it only has the ability to work in this world, and the mind is not itself Existence. Therefore, the true Self is not the mind, the true Self is the Pure Consciousness that sees the mind. That is the Truth of everyone. And that Existence, your true Self was never born and never dies. The true Self exists eternally and always. Of course, It is formless, nameless. Yet It exists clearly as Existence. There is only That. Nothing else exists but That. And that is the Truth of each one of you. Even though this is the Truth, however, no one knows their own true Self. It’s very strange, isn’t it? (laughs) That is because the mind covers the Truth. Therefore, you must still the mind. The mind—karma, ignorance, pain-bearing obstacles, desires—the mind is defiled by these things. So therefore, by eliminating these things from the mind, the mind will become as if it were transparent. If you do that, then the true Self emerges alone. What you have to learn, what you have to do, is only that—to realize your true Existence. After that Shri Mahayogi gazed at this young man for quite some time. Everyone in the room was captured by this scene of Shri Mahayogi’s gaze! The presence of Shri Mahayogi had already changed the room, then Shri Mahayogi’s answer was probably from a completely unexpected angle, beyond what our mind can even come up with, but his gaze, the power to transmit the Truth through silence…what a moment! We humbly bow down from the depth of our hearts. Who else has such a profound ability to teach the Truth but him!!! After the class, this young man described how when Shri Mahayogi gazed at him, he simply gazed back. And as he gazed he felt a pleasant feeling of warmth and kindness, and he was left with the feeling that he and Shri Mahayogi were one. Though he could not describe exactly what was happening, he said that everything around Shri Mahayogi became blurry and he just wanted this gaze and this moment to continue. He felt that Shri Mahayogi looked as if he were the Buddha himself! I went in with an open mind, with an attitude to learn as much as I could. But I got something more than what I was expecting. I felt a divine presence from the master, almost like an out of body experience. When there was a long silence after a young participant asked a question and the Master answered, the feeling in the room was overwhelming. I did not understand all the words said but I felt that it is something I will eventually understand as I continue to make an effort to practice. I understood why some people become calm after practicing Yoga. Just as our bodies need nutrients, everything we hear and see become nutrients for our mind and soul. I am excited for what’s in store and I am definitely coming back to class again. I am in awe. Thank you for inviting me. About the question at the end: knowing that translation is SO HARD, especially with such ethereal answers, I found some real insight in it and LOVED the eye contact he made with the one who asked the question–that was electric!! The whole experience is VERY MUCH like learning a beautiful language or learning to sing. You KNOW that it will take lots of dedication and time to get to something very beautiful, and you just have to work through all the clumsiness that is natural at first. I will try to attend the Sastangha. We invite you to experience the teaching and blessing of Shri Mahayogi for yourself! This Saturday please join us for Satsangha—hear Shri Mahayogi’s teaching and take the rare opportunity to ask him questions. For Satsangha, please reserve a space by Wednesday 1/30. The location will be determined based on number of attendees and we will share the final location on Thursday 1/31. 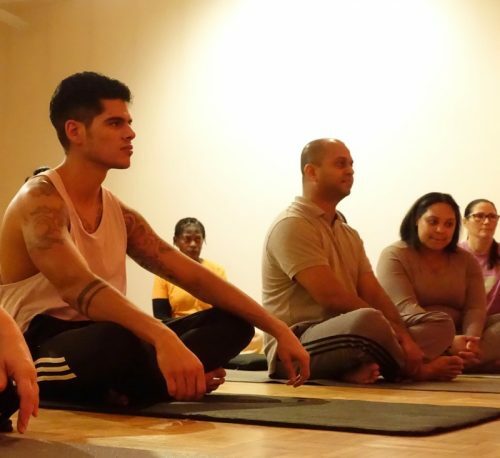 Join us each Sunday through March 3rd for the Sadhana Program with Shri Mahayogi—learn the practice of asana and meditation.